The night before He went to the cross, Jesus prayed over and over for His disciples, “Make them one.” He even prayed that we would be one as He and the Father are one. In fact, He asked that we would be one so that the world would know that He was sent by the Father. Those are serious prayers, aren’t they? Yet, all too often, we in the Church have a tendency to minimize our disunity. We think it’s not a big deal. But clearly, from the Lord’s perspective, it’s vital. What if the people in your congregation had a vision for walking unitedly together? What if they were given practical tools to help them in that direction? Do you think it could make a difference for your church? Watch and listen as Christian leaders from all across the country talk about why biblical unity is imperative, where they’ve seen it, and how it could happen in your church. Add in practical, biblical teaching by Tom Kraeuter and this series will have major impact on your congregation. 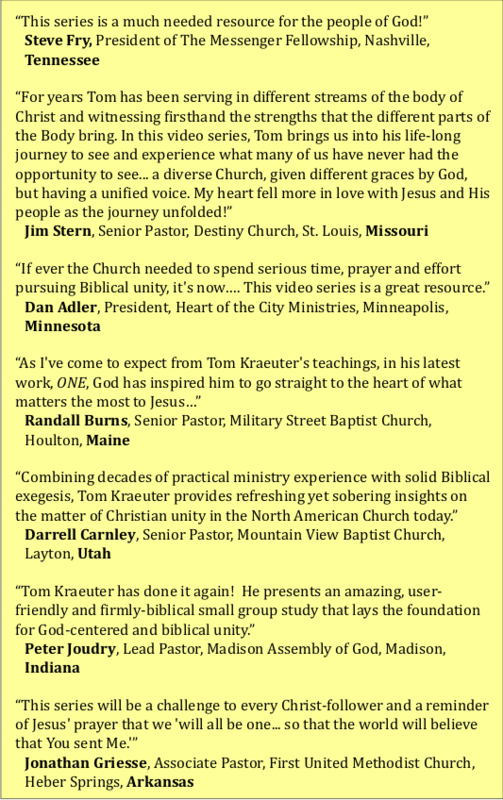 Order a digital download (instead of the DVDs) at https://vimeo.com/ondemand/biblicalunity But you’ll need to come back here for the Participant’s Guides. Be sure to order enough of these for each person in your small group to have one. It includes thorough notes for each video session and great discussion questions for follow up. This Particpant’s Guide is the key to making this DVD study successful. You know you’re going to want your entire congregation to go through this, so why not just order at least 50 copies and get the best possible price?